More About Hernando Pest Control. John McCormick founded Hernando Pest Control in 1984. In the beginning, John was the only employee and conducted the business from his Brooksville home. 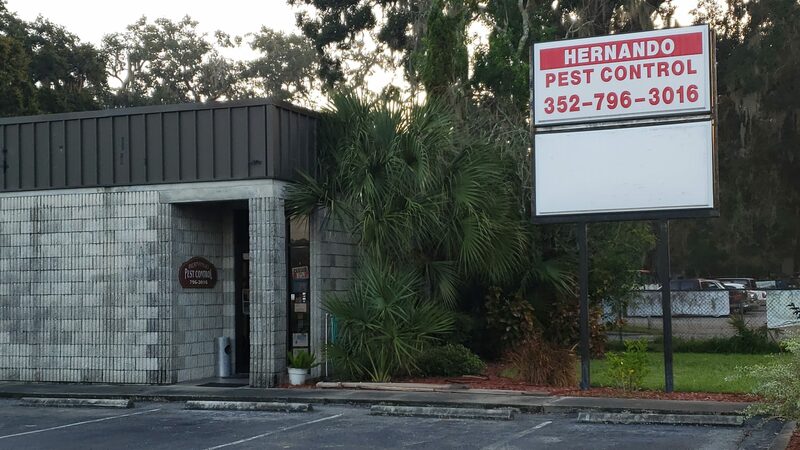 In 1988, Hernando Pest Control moved into a small two room office on Cortez Blvd. with three employees. In four short years, we out grew those facilities and moved to downtown Brooksville on N. Bell Ave in with six employees. In December of 1996, Hernando Pest Control moved to the shade of one of the largest and oldest oak trees in Hernando County on W. Fort Dade Avenue, where we spent 15 happy and prosperous years. When John McCormick retired in 2002, Mollie Spencer took over the day to day operations and ownership of Hernando Pest Control. The office moved to our new and current location at 806 W. MLK Jr. Blvd in December 2011. Hernando Pest Control is a team of dedicated, positive and successful professionals who constantly strive to conduct ourselves with the highest level of Honesty, Integrity and Expertise. We will work to earn our clients’ trust and confidence through building relationships and delivering exceptional, consistent services. At Hernando Pest Control, we strive to protect the health and property of our clients and their families. Our valuable services will be of the highest quality and will exceed industry standards in order to provide peace of mind to each member of the community that Hernando Pest Control touches. The vision of Hernando Pest Control is to provide peace of mind to our community by protecting and preserving health and property through state-of-the-art professional services for our residential, commercial, and industrial clients, while creating a safe, family oriented work experience for our team of professionals. With our 24-hour* response time, we ensure you will have your pest control issue addressed immediately. We make pest protection easy and hassle-free, providing you with the best customer service experience in the industry.